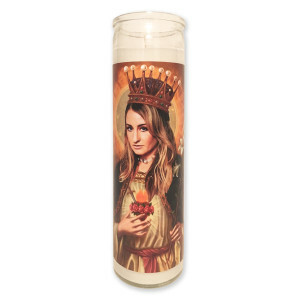 Saint Margo Price 8” prayer candle. The most divine way to bless any Margo Price disciple. Tall, slim votive candle adorned with high-quality, symbol-laden graphic. A lot to ponder here, with the pearls, lilies, mystic roses, flaming heart pierced by a sword. Some may consider it a bit irreverent (I don't) but remember Margo Price is a self-described "outcast and a stray" - and hopefully she will stay that way. She's had pain in her life but doesn't give up and the image on the candle reflects that. I'm glad I purchased it, it's both unique and strangely attractive. Although I remember how John Lennon was hassled back in 1966 for a certain remark he made about Christianity, I don't think this candle will cause mass demonstrations or record-burnings as John's remark did.